Magee Marsh is a beautiful preserve in Ohio, where large numbers of migratory birds stop briefly as they migrate from their wintering locations in the south to summer breeding grounds in Canada. They wait in the marsh until just the right moment to fly across Lake Erie. This weekend was particularly crowded with birders who come especially to see the many species of warblers passing through, as well as those that stop here to nest. 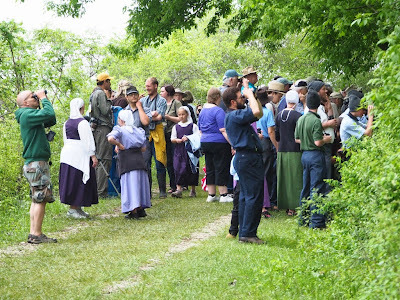 We joined the huge crowd depicted above, all hoping to catch at least a fleeting glimpse of a shy Connecticut warbler that was in the woods. 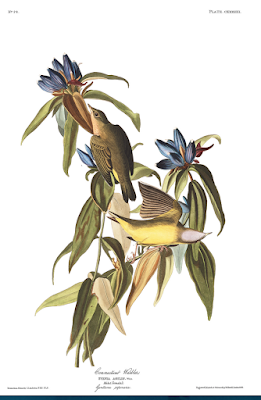 Since we didn't succeed in photographing the poor bird, I included the John James Audubon picture. Sadly, the crowds of birders appear to be putting enormous pressure on the birds along the boardwalk that allows access to the marsh. We read that a prothonotary warbler and a woodcock that were nesting near the boardwalk have abandoned their nests because of all the people nearby. Environmental pressure from groups often occurs slowly, so that no single individual realizes that his innocent actions have tiny but real consequences. I've seen the term "future eaters" applied to this situation, where environmental damage accumulated slowly but inevitably. Birdwatching seems to be about as non-destructive as any activity could be. Is it? 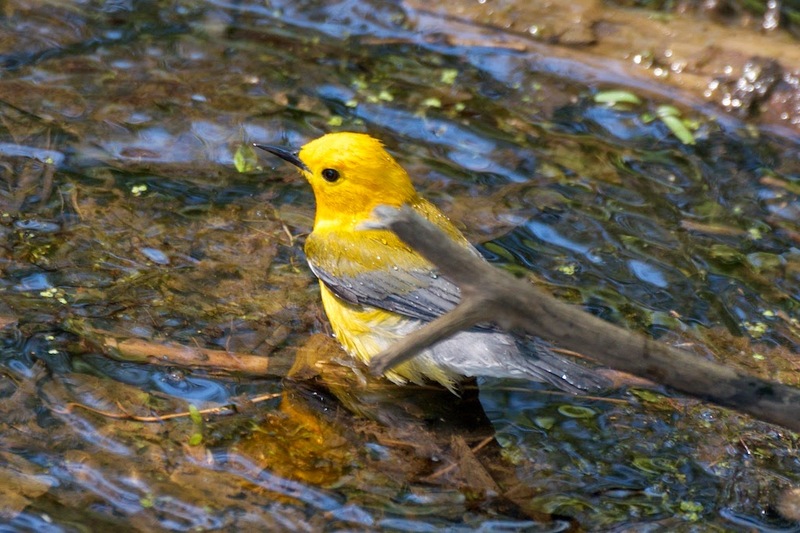 A prothonotary warbler (photo from last year at Magee Marsh). 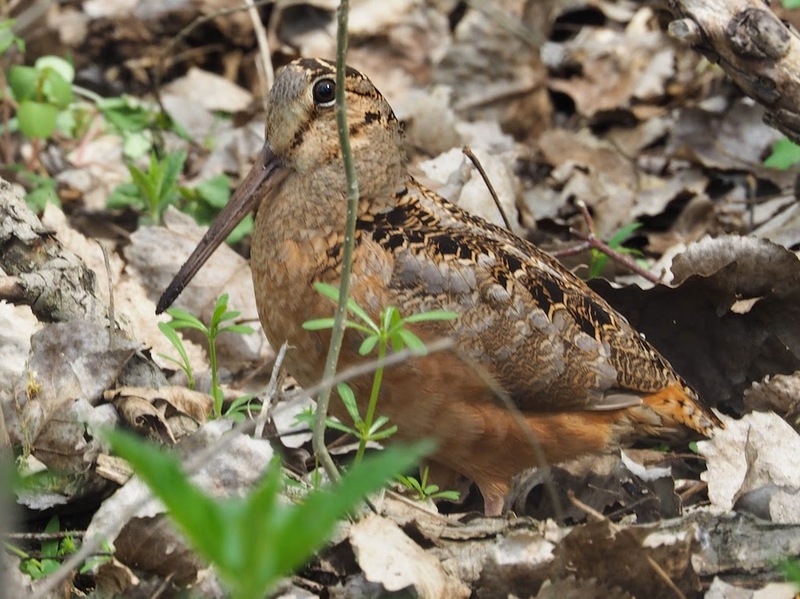 A woodcock we saw from the boardwalk a few weeks ago. 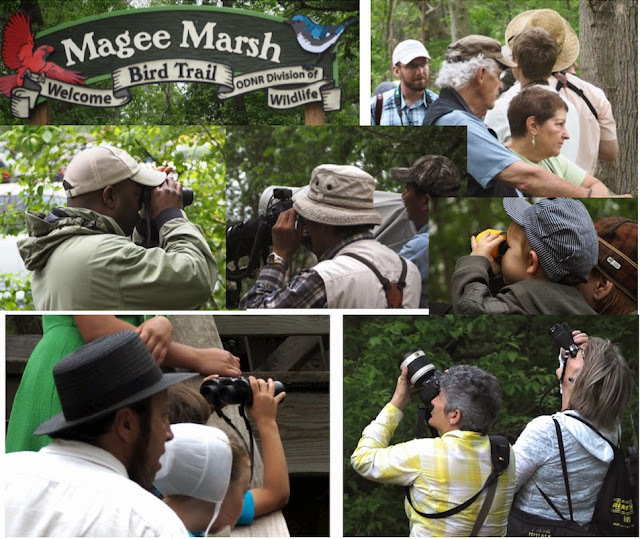 Birders like these who were there on Saturday love Magee Marsh and who can blame them? I have already posted this on my food blog.